Above: Hans and Päivi with Esta and Nana. For 16 years, Weimaraner breeder Dr. Hans Schmidt and his wife, Päivi, have organized an October hunt for Weimaraner owners, mostly breeders. Hans and Päivi live in Ostfriesland (East Friesland) in extreme northwestern Germany (West Friesland is over the border in Holland). Hans, a retired veterinarian, is also the breeder of my pup, Panu zum Laubwald (Piezl). He graciously invited us to the annual two-day hunt on the tiny island of Baltrum in the North Sea off the northern coast of Germany. The primary quarry is the rabbit (Kaninchen), hundreds of which infest the vegetation-covered sand dunes. The rabbits burrow into the dunes, thus weakening them against the vicious storms that occasionally l ash the island. Because there are no predatory animals on the island (other than hunters), the rabbits multiply, well, like rabbits. 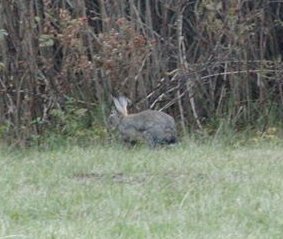 A few pheasants (Fasanen) and European hare (Hasen) also are to be found as well as the small roe deer. Seagulls (Möven) are regarded as pests and are shot at will. A limited number of pheasants are permitted to be harvested. Mainly, "rabbit" is the name of the game. Baltrum and the other islands are vacation spots. The weather is chilly, even in summer, but the out-of-doors is a powerful magnet for vacationers, particularly those who live and work in the densely populated German industrial areas. Travel to Baltrum is via ferry. Actually, the area is tidal mudflats (Watten) and a channel has to be dredged for the ferry. The ferry has to wait for high tide in order to approach the quay. On calm days and low tide, intrepid visitors can wade to the island about five km offshore. Loading up at the ferry dock is a chilly proposition in the area where the wind seems to blow constantly. 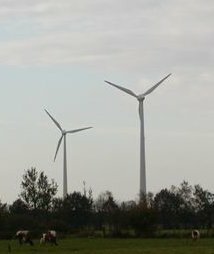 Windmill farms are a growing industry in the area. After the ferry lands, it's a walk from the quay to the small villiage of hotels and guest houses and our hotel, Strand Hotel Wietjes. After waiting to load up for the 30-minute trip, the dogs are glad to get out to run. Given the distance, we didn't bring Piezl with us, but left him and our other dogs with our friends Debra and Myron Meifort of Westend Kennels. 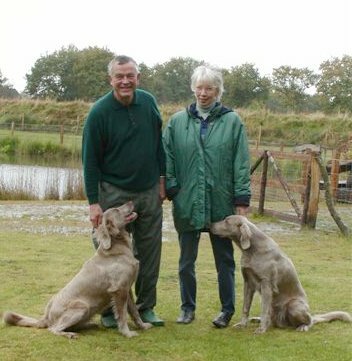 Debra and Myron are professional field trial handlers and trainers as well as Weimaraner breeders. We arrived on Thursday, hunted Friday and Saturday and returned to the mainland on Sunday.